The focal range is very interesting as it gets to 120mm and with ex tele you have a further 1.4 zoom in 4K with a working distance of 24cm. It covers 36mm horizontally as minimum. I was extremely interested in this lens when specing my new GH5 setup. I contacted Nauticam about it, and was told the "Panasonic 12-60 is fantastic, but it doesn't play as nicely with macro optics due to the lens' physical construction with lots of movement through the zoom range." The comment from Nauticam is a bit cryptic! I already have the 35 macro port and I have wet lenses however as I am considering the 8-18mm that needs the 7" port I was thinking of housing the leica lens too. I have just dived with the this lens housed in the 7 dome. I havent done any editing yet. The lens works fine behind the dome with the correct port extension (Im using my pana 12-35mm 2.8 mkii setup). Not as easy to setup as the 12-35mm cause it is a bit wider. Actually, it is very good for closeups behind the dome and this the main reason I prefer over 12-35mm. The only downside is that Nauticam doesnt have a manual focus gear for it as told by reefphoto. Edited by thani, 29 August 2018 - 11:19 AM. Exactly right, that is why I decided on the 14-42 PZ lens with WWL-1 and my current Subsea +5 diopter, both on bayonet mounts. The plan is to try and get back the flexibility that I had with the camcorder plus flip diopters. I have not had a chance to get the rig wet yet, though, so we will see how well it all works out. I will still be interested in your and Thani's thoughts on the 12-60, though. It should be interesting. I have the 7” glass dome which needs an addition extension port. If you are taking about the acrylic 7”, it might be a different setup. Double check with ReefPhoto before you buy. The setup I have today works with the pany12-35mm and the 12-60 Leica as well. Do you use the N85 Nauticam mini extension 30 or the n120 to n85 60mm? Edited by Interceptor121, 30 August 2018 - 04:33 AM. nau.36052 - Nauticam N85 to N120 47mm Port Adaptor with Knob for M4/3. I bought this originally for the 12-35mm 2.8 lens with manual focus gear and the 180mm glass dome. The question is whether the lens will physically fit through the 30mm mini extension which I doubt as I know the 12-40 doesn't (and this is narrower than the 12-60). The mount on the 7" dome is narrower aluminium rather than the standard plastic bayonet on the mini extensions with lock. Ibid the 8-18mm. I don't think it will fit through the mini extension ring. Quick update as expected the leica 12-60mm works fine with the 6” wide angle port. I have tried also the mini extension 30 the lens fits in it however am unsure the gear will because of the secure latch that holds the extension to the master port. Interesting findings. 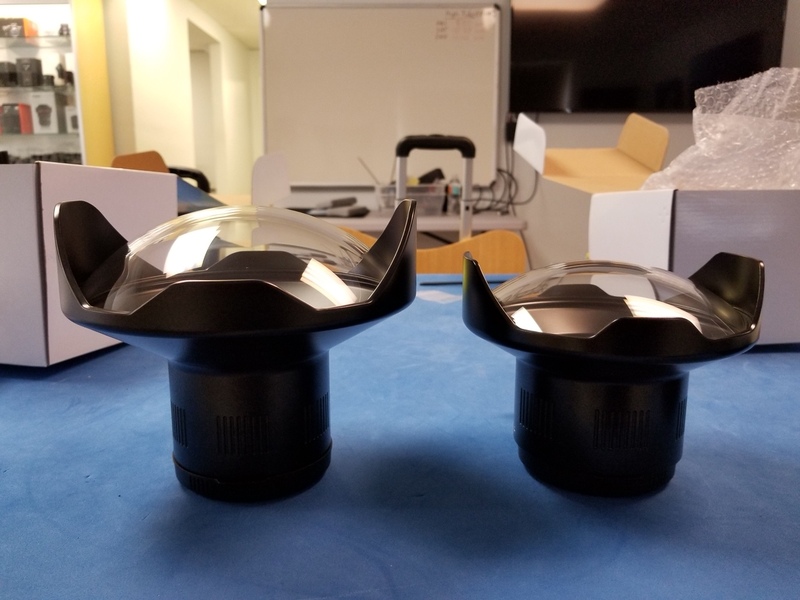 Why would Nauticam recommend a 2mm shorter extension (67-65) for the longer Leica lens with the same 180mm (7) glass dome port? Does this make since? Sell more parts? Don’t really know 2mm are unlikely to make a substantial difference. Ergonomics maybe? How does it work for you? On paper considering the port is the same it doesn’t matter.